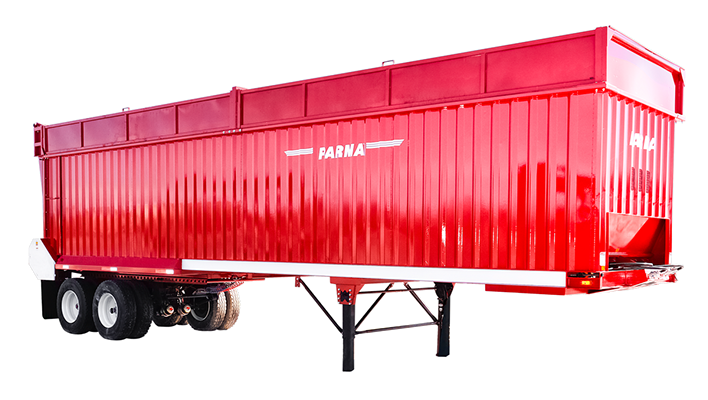 Parma Forage boxes and trailers are designed with all welded, heavy-duty construction using 14ga and 12ga corrugated walls and solid welded 10ga floor plate. The flat bottom floors eliminate bridging of the material no matter the consistency. The double apron floor chain is made with heavy-duty TY78 “big barrel” riveted chain and welded 2 inch channel slats for years of worry free unloading. Some of the standard features of the Parma Forage boxes and trailers are an industry-largest 2 3/8” drive shafts, with split poly bearings for economical and durable life. A simple front idler shaft mechanism uses durable poly sprockets on 1 15/16” shafts. Steel sprockets are available upon request. High torque hydraulic motors power the floor for fast and easy unloading. A wide 90 inch box body provides for a high capacity trailer made to last. Each of these forage boxes and trailers are available with a simple top hinged swing gate or convenient double “barn style” doors that latch securely in the floor chain. Five or six foot wall heights, with optional extension panels, may be ordered to assist in over-the-side loading of manure, grain, sugar beets, or the many other commodities. Semi trailers are available with new axle undercarriages to maximize your hard earned dollar. Call, Email, or Leave a short message on our Contact us page and we will answer any questions you might have. Find and order Sprockets, Chain, Poly Sprockets, and other common parts. We will ship it the same day of order if in stock. For other parts and more info please call. Look through pictures of the Forage Trailers.